In a large bowl, blend the dry cake mix, eggs, oil, and juice from the pineapples instead of a cup of water. Warm the dutch oven over a few coals. Remove the dutch oven from the coals. Lay eight pineapple slices in a circle with a ninth slice in the center. Place a maraschino cherry inside the hole of each pineapple slice. Pour the cake batter over the pineapple slices in a large circle, ensuring it fills out to the edges. Bake at about 350 degrees for about 40 minutes. The cake is done if a toothpick inserted into cake comes out clean. Bake longer as needed. When finished, remove the dutch oven from the heat and let the cake cool for 5 to 10 minutes. Open the dutch oven and lay an 11-inch dinner plate upside down on the cake. Holding the plate in place with one hand, and the dutch oven with the other, flip the whole thing upside down. Lift the dutch oven leaving the cake on the plate. Options: Go ahead and place more cherries in the spaces between the pineapple slices if you want more color and flavor. Ray M. made this cake! 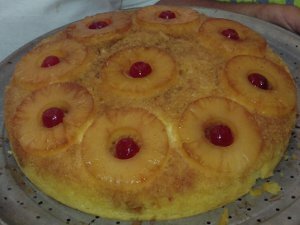 Let me know how you enjoyed your Pineapple Upside Down Cake! love the pic. hope i make it soon!!!!!!!! i am in 4h helping hands 4h.!!!!!!!!!! Great success with this recipe. I thought I would have trouble getting the cake out of the dutch oven, but it came out easily. Just make sure you coat the sides and everything with butter! This recipe is awesome! My mom gave me a Dutch Oven for Christmas and I have no idea how to use it. Made this cake as my first ever Dutch Oven recipe and it turned out great! My Dutch oven was a little smaller but I still used the same recipe and it turned out fluffy and moist. I’ll be using more of these awesome recipes! Thanks for sharing your recipes.